The Galaxy Tab – now known as original Galaxy Tab to avoid confusion with its successor Galaxy Tab 7.0 – was abandoned by Samsung when Android 3.x Honeycomb came along but dedicated developers from the Android modding community are still hard at supporting the device as we have received news of a working alpha AOSP-based Android 4.0.1 Ice Cream Sandwich port of Galaxy Tab. If you’ve got an original Galaxy Tab, you may want to try it out after the jump! The news and ROM itself comes from the talented bunch of folks over at XDA-Developers – a Android modding forum – in the form of a thread posted by one of the ROM cooks: ani55. Two other developers Angel_666 and koudaxi were responsible for the first alpha build while ani55 added a couple of libraries to the ROM to make the camera and sensors work. As with all ROM flashing processes, your device must be rooted and have ClockworkMod Recovery installed. The developers explicitly state that you must be on Android 2.x Gingerbread-based bootloader and have EXT4 file format. Ensure that it has enough battery to last through the flashing process and please remember to take a nandroid backup of your device from ClockworkMod Recovery so you can revert back to your current, understandably more stable state in case you don’t like the ICS Alpha build. Lastly, this is an Alpha build so do not expect all things to work out of the box. In its current state, it is not ready to be used as a daily driver. Wait for the betas or the actual stable release from the community for that. 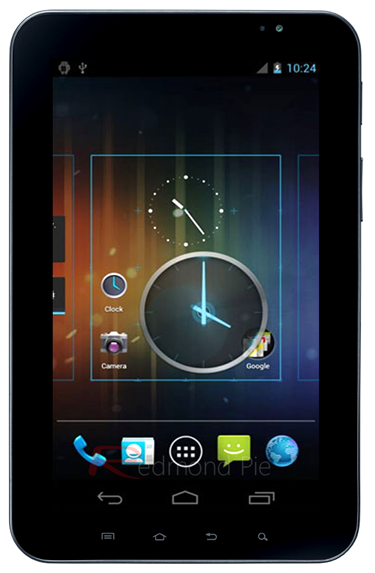 Step 1: Download the latest build of Ice Cream Sandwich for original Galaxy Tab from this thread. Step 2: Transfer the .zip file to the root directory of your Galaxy Tab. Step 3: Turn off your Galaxy Tab. Boot into ClockworkMod (CWM) Recovery Mode by holding a specific key combination. This can be found by performing a simple search on your favorite engine. Step 4: Format /system, /data and /cache from mounts and storage under main menu of CWM. Step 5: Wipe data / factory reset from main menu. Step 6: Go back to main menu and choose the .zip file you transferred in step 2 from install zip from sdcard > choose zip from sdcard. Ice Cream Sandwich will now be flashed to your Galaxy Tab. Step 7: Reboot device from main menu. If you followed the steps correctly, your Galaxy Tab will boot into an alpha build of Android 4.0.1 Ice Cream Sandwich. Have fun! If you have any issues or queries, visit the original thread on XDA.